Fort Saskatchewan residents with low income will soon have a new option for safe, modern and affordable housing, thanks to support from the Alberta government. 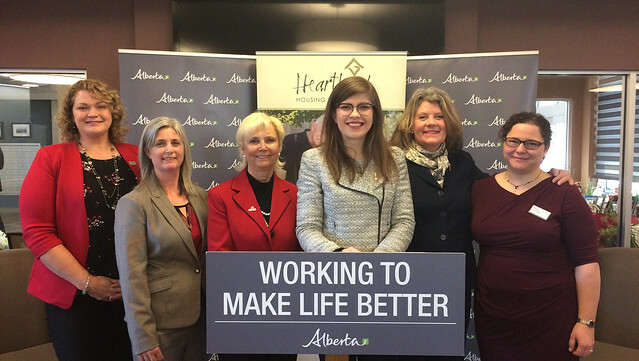 Minister Sigurdson, MLA Jessica Littlewood and Mayor Katchur join Heartland Housing Foundation to announce a new affordable housing project in Fort Saskatchewan. The province is investing $6 million toward an affordable housing project in Fort Saskatchewan. The new development is expected to provide around 83 one- and two-bedroom units for families and seniors with low income. The four-storey apartment building will be built on land donated by the City of Fort Saskatchewan, located adjacent to the new Dr. Turner Lodge. It will ensure people living on low income, in or near Fort Saskatchewan, can stay in their community. Currently in the design stage, the project will aim for energy efficiency and feature some accessible units and modern fire-suppression and safety systems. The Alberta government’s $6-million contribution is part of the $1.2-billion commitment in the Provincial Affordable Housing Strategy to develop a sustainable, affordable housing system and build and restore 4,100 affordable housing units.